For the second time since June, Russian nuclear bombers escorted by fighter jets have flown near U.S. and Canadian airspace around Alaska in recent days, prompting precautionary intercepts by American warplanes. The encounters come amid Russian war games along the border with eastern Ukraine, raising Western concerns that Moscow might invade to support pro-Moscow separatists battling the Kiev government since spring. A U.S. air command official acknowledged at least 16 Russian forays around Alaska and northern Canada in the past 10 days, describing them as routine training missions. One intercept spotted a Russian spy plane among the Tupolev Tu-95“Bear” bombers and Tu-142 reconnaissance and anti-submarine aircraft. “Over the past week, NORAD has visually identified Russian aircraft operating in and around the U.S. air defense identification zones,” Maj. Beth Smith, of the U.S. Northern Command and the North American Aerospace Defense Command, toldThe Washington Free Beacon. The Russian defense military announced July 30 that “several” Tu-95MS strategic bombers escorted by MiG-31 interceptors had flown over the Arctic that day. Wednesday, a squadron of Sukhoi Su-34 fighter-bombers flew over the Barents and Kara seas “for the first time,” ITAR-TASS reported. Russian Air Force Chief Commander Lt. Gen. Viktor Bondarev called the Arctic drills “the top goal” of air exercises in Russia’s southern Astrakhan region. 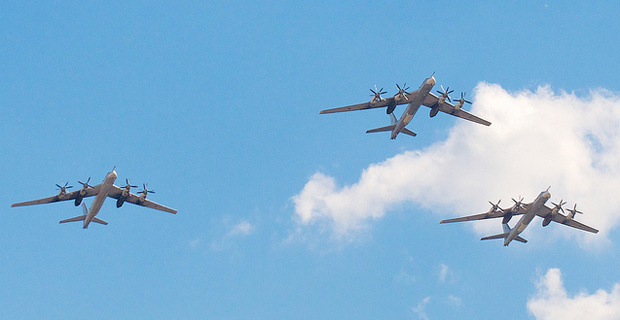 In July, Tu-95sbombed simulated naval targets in the Black Sea. In response to the overthrow of the Moscow-backed president of Ukraine, Russian President Vladimir Putin annexed the Black Sea peninsula of Crimea in April. The July drills came a month after U.S. F-22s intercepted four Tu-95 Bears over the far western Aleutian Islands. Two of the strategic bombers then flew within 50 miles of the Northern California coast before turning away. Russian military spokesman Col. Alexander Gordeyev said last month that “the intensity of Air Force flights in the Arctic increased several-fold” this year. He said that in addition to patrolling and searching for “foreign submarines,” the Arctic flights were for “ensuring the security of sea navigation and carrying out search and rescue, and scientific missions,” ITAR-TASS reported. To some U.S. military officials, the excursions carry echoes of the Cold War, when Soviet nuclear bombers tested U.S. air defenses.